Car 1 is our Command vehicle, a 2002 Chevy Suburban 4X4. It is used as a direct response vehicle by the officers of our Company when they are "on duty" and responding directly to the scene from home. Car 1 is equipped with an SCBA, tools, phone, med bag and an AED. Car one has a heavy duty pull-out command center complete with radios, white boards and a computer station for use in larger incidents. Utility 7 is a 1998 Dodge Ram 2500 4X4 extended cab diesel. Utility 7 is used as a medical assist vehicle, a brush fire vehicle and as a transport vehicle for various situations. Utility 7 has a 200 gallon fiberglass tank and pump on a skid unit, plus indian packs and hand tools for fighting brush fires. It also carries a fully equipped medical bag. 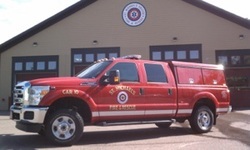 Car 10 is a 2011 Ford F-250 Super Duty and is the newest addition to the SMFR fleet. It seats 5 and contains a selection of hand tools, medical equipment, and rehabilitation supplies. Car 10 is used primarily as a utility vehicle for transportation of personnel and equipment to and from department functions, but may also be used to transport additional manpower to emergency scenes.